The best school teachers often use unconventional or interesting methods to help their students learn. 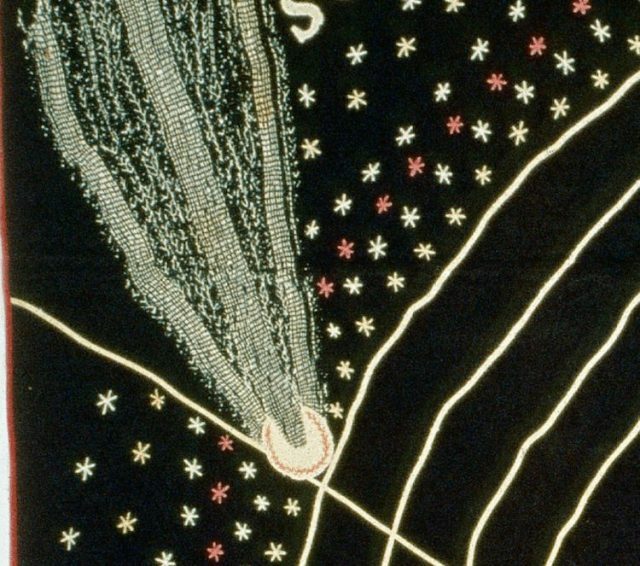 In 1876, when Ellen Harding Baker was teaching astronomy, she employed a very “out of the box” method: she used a quilt. 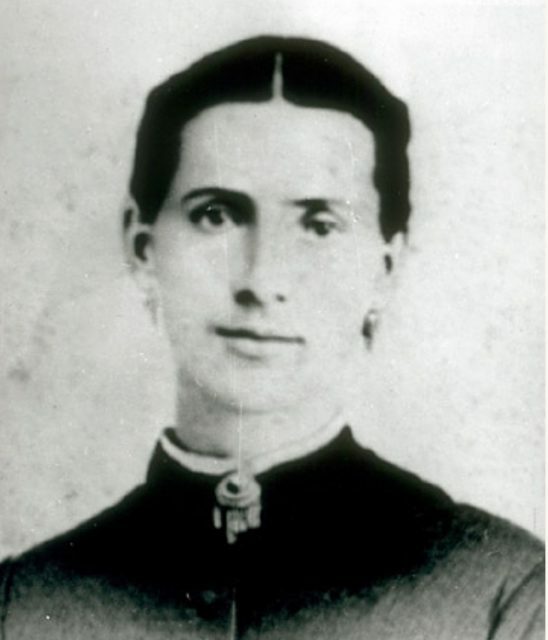 Born Sarah Ellen Harding in Cincinnati, Ohio in 1847, she married at the age of 20 and gave birth to seven children before she died of tuberculosis in 1886. 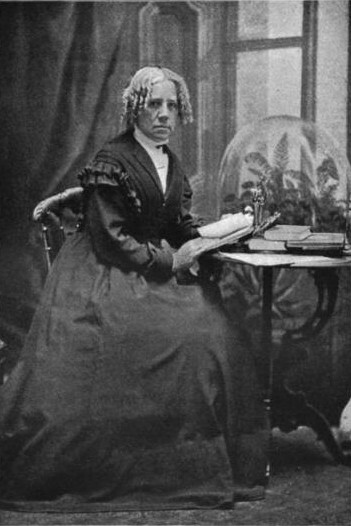 Baker was also an astronomer – an acceptable field of interest for women in the 19th century – and sought a way to illustrate the cosmos to her students during her astronomy lectures. So she spent the better part of seven years designing and sewing this extraordinary quilt. 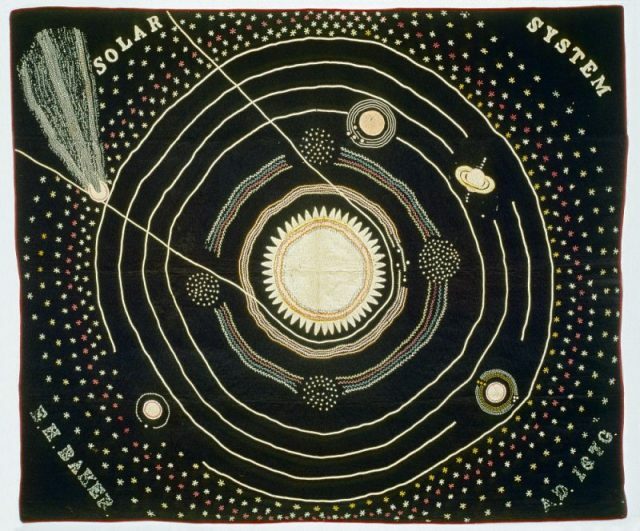 Currently held at the Smithsonian’s National Museum of American History (accession number 1983.0618), Ellen Harding Baker’s “Solar System” quilt is a work of wool and silk and embroidery, on top of a wool background. 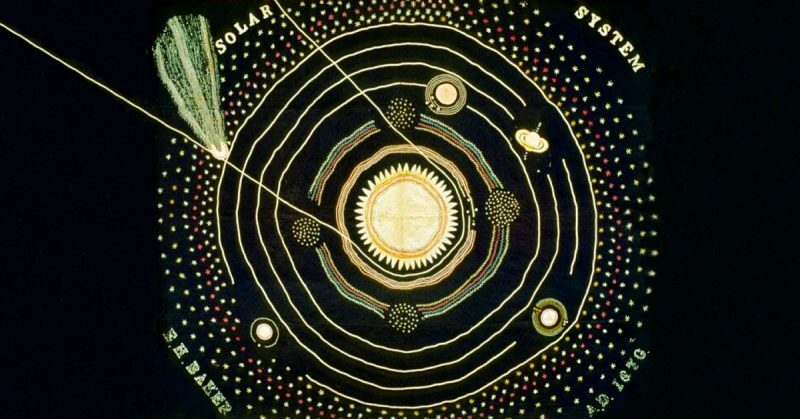 Created in 1876 by Ellen Harding Baker and used to assist with her astronomy lectures. 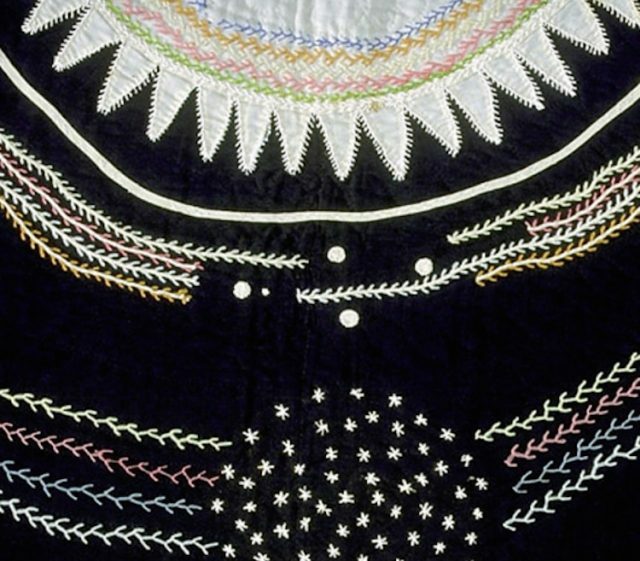 The quilt, which measures 89” x 106”, is a colourful mix of wool-fabric appliqué, wool braid, and silk embroidery on a simple black background. Just as astronomy books at the time would have illustrated, the sun is featured prominently in the centre, with the eight planets of our solar system arranged around it, as well as the asteroid belt and many stars. Also included are our moon, the Galilean moons of Jupiter, and several moons of Saturn, Neptune and Uranus. Saturn’s iconic rings are also featured, as yellow fabric appliqué. Interestingly, Baker also included a comet, which has been speculated to represent Halley’s comet, as it would have last been visible in 1835. In order to make sure that she had an accurate representation of the solar system, Baker travelled from her home in rural Iowa to the Chicago Observatory where she viewed sunspots and a comet (possibly the Great Comet of 1882), using a professional telescope. Baker’s quilt does not contain any galaxies other than our own, as they were unknown at the time, nor does it include Pluto, which was not discovered until 1930. According to quilt historian Barbara Brackman, other astronomical quilts from same period as Baker’s include one by Eliza Sumner which features a “representation of the Starry Heavens,” and a quilt by an unknown maker that was sold at the Carlsen Gallery Auction that includes the sun, seven planets, and many moons. And the tradition has not stopped: almost 100 years after Baker made her quilt, astronomer Cecilia Payne-Gaposchkin created a yarn-on-canvas needlepoint of the supernova remnant Cassiopeia A., and several other artists have brought the textile arts and astronomy together, including Judy Chicago with her project Dinner Party, and Canada’s Sarah Hatton, in her Detachment series. Unfortunately, Baker died at the age of 39, only 10 years after making this quilt, leaving behind five of her seven children. Her quilt is not currently on view at the National Museum of American History, but art prints of it are available with all profits going to the Maria Mitchell Association.